Wastewater is the ultimate untapped resource. Aquatech’s approach is to see wastewater as an opportunity, not a burden. Today’s technology developments allow us to realize this vision and offer advanced wastewater treatment processes. Whether it’s ensuring that industries meet stringent discharge compliance or recovering energy from municipal sewage, Aquatech will seek to maximize wastewater’s true hidden value. Fresh water is a scarce commodity; this fact is well acknowledged by one and all. People at all levels be it general public, governmental bodies, and industries understand the implications of good quality water availability in terms of quantity, cost and wastage. As a consequence, there is a growing consensus on wastewater treatment for recycle/reuse. To achieve wastewater treatment for recycle or zero liquid discharge (ZLD) on an economical basis, it is not one technology that fits all, but one needs multiple technologies and careful integration of these. Each wastewater has its own nuances and to deal with these requires intimate knowledge of water chemistry and experience in the applicability of each technology. Besides technical feasibility, economic feasibility of a given treatment process for recycle is very critical and advancement in membrane processes has aided towards this cause. 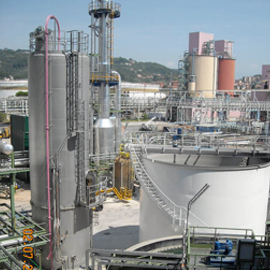 Aquatech has successfully implemented integrated solutions for the treatment, recycle, and ZLD of various challenging waste streams which include municipal sewage, cooling tower blow down, flue gas desulfurization scrubber’s purge stream from high sulfur based coal fired power plants, produced water from oil and gas production industry and effluent recycle for petroleum refineries, petrochemical and chemical plants etc.